Jawnsy's Journal on Life, Software and Engineering | An Electrical Engineering and Computer Science student documenting his challenges and experiences. Occasional philosophical rants too. Last week, my mentor mentioned that high-voltage power transmission circuits could sometimes be used to provide reactive power support when on potential but off load, particularly for parallel lines. Anecdotally, based on my limited understanding of the Ferranti Effect, this seems perfectly reasonable: light loading on the line results in elevated line charging capacitance, which is then injected to the system at the point of connection. In order to understand the results, we have to understand the cause behind the Ferranti Effect. All transmission lines (even the kind discussed in Radiation and Propagation courses) behave the same way once the line length approaches a tenth of the signal wavelength. Due to the relatively low frequency of utility power (60Hz in North America and 50Hz in many other parts of the world), the wavelength is pretty long, so these effects only begin to appear in significantly long (greater than 300km) transmission lines. Lines of a moderate length (greater than 300km) can be modelled simply as a series resistance, series inductance and shunt capacitance – in Power Systems, we often call this model a “Pi section” (this moniker makes more sense if you separate the capacitance at the sending and receiving ends of the line, dividing them by two). Longer lines (those exceeding 500km) are then an extension of an already-solved problem: they can simply be modelled using multiple moderate-length segments as appropriate. Keen readers will notice that this is, quite simply, a two-port network model: we can consider each Pi section a black box, with sending-end voltage/current and receiving-end voltage/current. Many of us rely on an approximation of how wires behave: in most applications, they have infinitesimal impedance, and so the impedance may be neglected in calculations. However, when we approach power transmission, the voltages and currents are much higher than experienced elsewhere, which can have quite a profound impact on system operation. I hope that this brief discussion provided a reasonable introduction or review. If not, the Kathmandu University also has a very good handout on the subject. In all transmission lines, for power or signals alike, optimal power transfer occurs when the load impedance matches the characteristic impedance. In Power Systems, we like to relate these quantities to units Power (Real, Reactive and Apparent) because these quantities can always be directly compared regardless of phase angles, power factors, harmonic distortion levels or voltage levels. If the amount of power being transmitted equals the SIL, the line mutual coupling (the inductance and capacitance in the model) cancels each other out, thus resulting in the line operating at unity power factor. When the amount of power transferred is below the SIL, the power factor is leading (capacitive), and when the amount of power transferred is above the SIL, the power factor is lagging (inductive). Intuitively, I understand this behaviour by thinking about the cause of these impedances, though I am not a physicist, so this intuition is best understood as a useful analogy, not as fact. I imagine lines have some slight twist when installed, giving rise to the series inductance. Likewise, lines are conductors of different potential separated by a dielectric (air), which results in some capacitive coupling between lines. The inductance is fixed, but the amount of reactive power absorbed by the series inductance is proportional to the current flowing across the line. On a lightly loaded line, or where the receiving end is an open circuit, the current is very small, so the inductive nature of the line is minimized and the capacitive behaviour dominates. Thus, the line is below the SIL and operates with a leading (capacitive) power factor. Finally, to get to the real point of this article. Given the above background, it follows that lightly loaded or open-ended lines will inject reactive power. With lightly loaded parallel redundant lines, it is therefore possible to open one line and use it to provide reactive power (var) support for the system. For my simulation, I used two parallel 230kV lines, each 600km long, with three ideally-transposed phases on each right-of-way (in delta configuration with four bundled sub-conductors). These lines were supplied by an infinite bus (voltage source at 22kVrms line-to-line) with a 22/230kV Wye-Delta transformer. 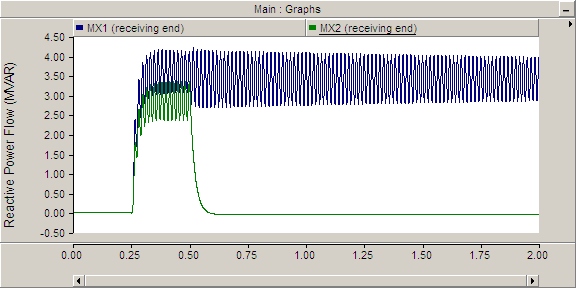 At the receiving end, a 300MW+5Mvar load was installed. ﻿Note that TLine1 has a depressed receiving end voltage due to the current flowing a cross that line (the line inductance cancels out the Ferranti effect), but TLine2 has an elevated receiving end voltage due to the Ferranti Effect. Also note that the reactive power flow at the sending end for TLine2 is negative, indicating that reactive power is flowing “backwards” to the sending end. The breakers were configured to begin open and close in at 250ms to energize the circuit. Afterward, BRK1 remained closed and BRK2 was reopened at 500ms. We can see that reactive power initially flows across both lines, but when the receiving end circuit breaker is opened, reactive power ceases to flow. 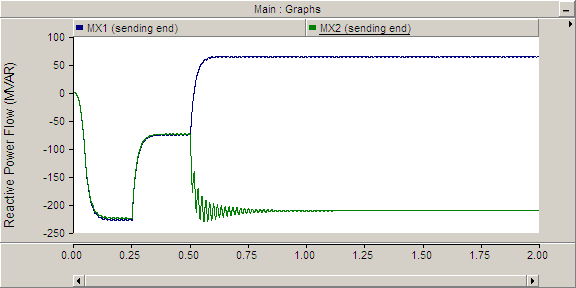 Note that the x-axis shows elapsed time of the simulation (in seconds). When both breakers are opened (until 250ms), there is a significant line charging capacitance drawing reactive power from the system. After the breakers close, the reactive power demand drops significantly (though it is still slightly capacitive due to both lines being lightly loaded). Once TLine2 is opened at the receiving end at 500ms, something interesting happens: the reactive power injected by that line into the system returns to its line-end-open state, while TLine1 increases its reactive power consumption in unison. In conclusion, it is entirely possible to use a transmission line as a shunt capacitor. The CPAN ecosystem is one of the most compelling reasons for the continued growth of the Perl programming language. It has been discussed at length by numerous people, and there have been several attempts to imitate this aspect of the Perl community through projects like: CRAN, CCAN, JSAN and more. Unfortunately, in equal parts due to its age and design philosophy, the PAUSE system powering CPAN makes it difficult for distributions to be maintained by a group, rather than an individual. The inspiration for this post comes from a discussion I had recently with Florian Ragwitz, who contributes to several key Perl projects, including Catalyst, Moose, DBIx::Class and many more. First, a bit about how permissions on CPAN work. I upload Acme::Package to CPAN. Some time passes, and unbeknownst to me, another author uploads a different package, but which is called Acme::Package to CPAN as well. In the absence of any permission checking, if I then instructed users to install Acme::Package using the CPAN Shell, they would inadvertently install the wrong distribution! This has some rather serious implications: the other Acme::Package is probably quite different from mine, and a malicious author could have taken my software and added a backdoor vulnerability. The module namespace registration list. First-come status (the first uploader of a given package namespace “owns” that namespace). Going back to the example given, the second uploader of Acme::Package would not have permission to use the namespace. The package will be accepted into the archive, but will not be indexed, meaning that users installing Acme::Package will still get my distribution. If users want to install the other author’s package (which is marked as an UNAUTHORIZED upload in big red letters on CPAN Search), they would need to explicitly specify AUTHOR/Acme-Package-1.00.tar.gz. For packages maintained by several people, it is also possible to assign co-maintainer status to others, so that they may also upload a package and have it correctly indexed. This way, two or more people can work on the same package together, and upload it under their own accounts (without causing the upload to be marked unauthorized). Thus, PAUSE credentials do not need to be shared. This provides a nice solution to the malicious upload problem, but also has implications for team-maintained packages. In particular, consider the case where there are two authors working on Acme::Library. Alice uploads the first version to CPAN, containing modules: Acme::Library and Acme::Library::Main. The PAUSE Indexer grants Alice first-come permissions to both Acme::Library and Acme::Library::Main. Alice grants Bob co-maintainer status on both Acme::Library and Acme::Library::Main. Bob creates a new Acme::Library::Other module and adds it to the package. The PAUSE Indexer grants Bob first-come permissions to Acme::Library::Other. Subsequent uploads by Alice will cause the upload of Acme::Library::Other to be marked UNAUTHORIZED. Clever Perl authors have attempted to solve this problem in many different ways over the years, but none of them have been widely successful because they all rely on some degree of human interaction. Some notable projects have attempted to solve the issue by creating a shared PAUSE user to hold the requisite first-come or module list upload permissions, which may then be granted to all other team members through the existing co-maintainer facility. Alternatively, since it is easier for smaller projects, many modules simply assign first-come permissions to a single person, who is then in charge of providing co-maintainer permissions to others who would like to work on it. Both of these approaches have the same limitation: any people uploading new modules must remember to assign first-come permissions to the group or user in question. In our case, Bob should have assigned first-come permissions to Acme::Library::Other to Alice, who then must pass co-maintainer permissions back to Bob. Unfortunately, this almost never happens, and Alice must chase down Bob (who happens to be on vacation in Antarctica) or, alternatively, the already over-worked PAUSE administrators. Some projects deal with this issue by sharing a version control system and having all the uploads go through a single person, in our case, Alice. This fixes the permission problem, since first-come permissions are always granted to Alice, but it results in a single point of failure. If there are some serious security issues requiring an immediate release, Alice must be available (and, as luck would have it, she is vacationing in Antarctica at the time). One proposed solution, which is used in projects including Moose and Catalyst, is to use a special field in the CPAN Metadata file (META.yml or META.json) that defines someone as the “authority” for first-come namespaces in a distribution. Alice uploads a package to CPAN, containing modules: Acme::Library and Acme::Library::Main. This refers to Alice‘s PAUSE login, and is the person to whom permissions for new modules uploaded in this distribution are assigned. The PAUSE indexer, seeing the x_authority defined in META.yml, grants Alice (not Bob!) first-come permissions to Acme::Library::Other. At this time, Bob also automatically gets co-maintainer permissions to Acme::Library::Other. Subsequent uploads by Alice will be indexed properly. There are still some outstanding issues that need to be resolved, but the x_authority proposal represents a giant leap forward for team-maintained software. Other comaintainers: if Charlie joined the project prior to Bob‘s upload of Acme::Library::Other, then Alice still needs to grant co-maintainer permissions to Charlie. Unfortunately, the PAUSE Indexer cannot automatically grant permissions to him, since it has no notion of a “distribution,” only module namespaces. Malicious uploaders: in the worst case, if Eve joins the project and maliciously (or unintentionally!) changes the x_authority, she will automatically get first-come permissions on the namespace of any modules she adds. However, this is the same behaviour that we had in the absence of x_authority. Ultimately, the benefits of this feature (making group maintenance easier) drastically outweigh the cost (only a few small changes need to be made to the PAUSE Indexer). They are unlikely to cause any problems in practice, and the worst-case behaviour is the same as if we did not have x_authority at all. It isn’t perfect, but it is a solution that requires minimal effort and minimal changes to PAUSE. Eventually, the goal is to create a more sophisticated system that will handle the issues outlined above, as well as more complex ones, such as renaming distributions or moving modules between distributions. Thanks to Florian Ragwitz for spending some time discussing x_authority at length with me. He and Leon Timmermans proofread this article prior to publication. This is the second part of a two-part series (the first part provides an introduction) discussing the role of smart grids in electric power distribution systems. We will explore some past and current installations of smart grids, discussing their motivating factors, planning, implementation and results. Essentially, this article is a discussion where we learn both from our successes and our failures in the power industry, to inform our future decisions. Smart meters are the some of the earliest intelligent devices installed in distribution networks and critical to enabling the smart grid of the future. One of the biggest issues that every smart grid initiative encounters when attempting to incorporate the technology into their system is the public perception that smart meters violate the right to privacy. Consequently, if the utility does not handle the situation tactfully, the reduction in the rate of consumer participation can diminish the practical gain from smart grid installations. As mentioned previously, smart meters are capable of communicating wirelessly with the utility, receiving consumer usage data with the potential to control OpenHAN-compliant appliances remotely. In the face of intelligent adversaries with increasingly powerful computing systems, it is important to provide a significant degree of security and future proofing. In 2005, the Netherlands electricity distribution company Oxxio began widespread introduction of a smart meter for both gas and electricity. When the European parliament issued a directive to member states to begin installation of smart metering equipment, the public was neither educated nor reassured about the new technology. Economy minister Maria van der Hoeven decided to push for compulsory installation of smart meters and punishing refusal to install them with a fine of up to €17,000 or six months in prison. Amidst privacy concerns, consumer protection organizations fought rigorously against the law and won; smart meters can now only be installed on a voluntary basis as requested by consumers . We must learn from this stark lesson and avoid a similar outcome in future installations by ensuring adequate education for the public in order to assuage their fears and uncertainty, ultimately to ensure vital consumer participation. While the amount and timing of data provided by smart meters from the field does not pose serious privacy risks from internal misuse, there many security concerns surrounding external adversaries. In particular, there is the potential for malicious users to modify their usage data in order to influence consumer billing, either by reducing their own consumption or as a financial attack against someone else. Since the utilities would be making design decisions based on the recorded trends, outside manipulation of the data could cause catastrophic effects to equipment if not upgraded when needed due to underrepresentation of actual power consumption. In Ontario, the current smart grid deployment initiative involves the government, Hydro One’s distribution business as well as other local utilities. It demonstrates the need for very close cooperation between the utilities and their regulatory bodies, especially since much of their current success can be attributed to their work communicating with users. Learning from errors in past smart grid implementations, the Ontario government established several websites acting as a central point of origin describing smart meters, their function and their overall objectives. For support for the technical aspects of the deployment, Hydro One has partnered with Trilliant Technologies, which is a company that “provides intelligent network solutions and software to utilities for advanced metering, and Smart Grid management” . Trilliant’s expertise and extensive smart metering technology portfolio reduces Hydro One’s risk and guarantees a higher degree of flexibility than with other vendors. The smart meters operate in the unlicensed 2.4GHz radio frequency commonly used for ZigBee, Wireless LAN (IEEE 802.11) and Bluetooth, with Trilliant providing both the metering and the related communication infrastructure. Trilliant also designed the 1.3 million smart meters currently being deployed by Hydro One’s distribution arm. Thus far, current efforts to ensure network security and likewise to assure and encourage consumer participation in Ontario have been a success, and there are many other similar efforts taking place in other countries at this time. Because smart meters involve using an extremely complex device to do measurement for billing purposes, it must be completely free of defects, especially in light of Canadian requirements like the Weights & Measures Act. As climate change raises the average global temperature, Australia’s climate is one of the hardest hit: becoming hotter and drier than ever before. Australia continues to consume a considerable amount of electricity; in fact, 261.8 TWh of electricity was produced in Australia during 2006, and that figure is projected to reach 413 TWh by 2030 . With electricity demand continuing to rise, the utility may soon need to consider construction of new generation, transmission and distribution infrastructure. However, maintenance of an aging system is itself extremely costly, and simultaneously investing in new infrastructure is simply not feasible. As a result, Australia decided to implement dynamic rating of equipment in both their transmission and distribution systems, allowing them to better utilize existing infrastructure. For an example comparing static equipment ratings with those dynamically generated by Australia’s control system, see Dynamic Equipment Rating. Cagil Ozansoy, “Turning Down the Heat,” Australia’s Fast-Growing Electricity Sector Ramps Up Its Global Warming Initiatives, vol. 8, no. 1, pp. 29-36, January-February 2010. I originally wrote this article for a report submitted to ECE4439: Conventional, Renewable and Nuclear Energy, taught by Professor Amirnaser Yazdani at the University of Western Ontario. Over the coming months, Canadian utilities will overhaul installations of electricity consumption meters at residential and commercial premises in order to accommodate the upcoming smart grid. Until very recently, the most common method of energy metering was by means of an analog electromechanical device that functions based on eddy currents. While this meter has served the utility well, it is only capable of recording the cumulative amount of power consumed and must be manually recorded from time to time. However, it is not capable of recording how much has been used corresponding to a specific time of the day. A smart meter is a two-way digital device that accurately records and wirelessly communicates with the utility company at scheduled intervals (usually hourly), providing information about the amount of power consumed in a given time period . If this metering technology is implemented across an entire city, utilities would be able to observe usage trends and introduce time-of-use pricing in order to reduce demand during periods of peak energy consumption. By increasing the cost of electricity during times of day where demand is at its highest, consumers are encouraged to delay non-critical tasks until there is a reduction in loading on the system. In this way, the loading on the overall power system would remain more consistent throughout the day, increasing utilization of existing capacity and potentially reducing voltage fluctuations in the distribution system. Less variation in power flow will yield better stability of our system and more efficient use of our assets. Ultimately, it will raise overall consumer awareness of the need to conserve energy. In addition, a more futuristic goal of smart metering in residential areas is to incorporate the concept of smart appliances. Using the HAN protocol, the smart meter will be able to control compatible devices and coordinate with local consumer loads to reduce strain on the distribution system. Smart devices would be able to collaborate with other neighbourhood meters in order to decide when to allow or postpone the operation of non-critical in-home appliances. In essence, the main goal of smart appliances is to further extend the function of the smart meter, allowing better organization and load management than ever before . The installation of smart meters in homes and businesses in Ontario may already be evident. The Ontario government, in collaboration with Hydro One and other local distribution companies has already begun the long-term transition to a smarter grid system by mandating the installation of a smart meter in every home in Ontario by the end of 2010 . While the meters are not yet transmitting telemetry, the installation of the smart metering infrastructure will pave the way to a world of future possibilities. Another significant way that smart grids will benefit residential consumers is providing a means to incorporate growing distributed generation systems. For example, home customers will be able to integrate solar panels or wind turbines on their roof and sell electricity back to the grid at a predetermined rate set by the government; in Canada, this is known as Feed-in-Tariff rate for alternative and renewable energy sources. Although consumers are already permitted to connect distributed generation systems, there continues to be very limited deployment of these generation sources in residential areas, particularly since it poses significant problems to the voltage system including the introduction of harmonics and voltage fluctuations. Another potential issue with integration of distributed generation is that most renewable energy sources depend on natural phenomena and are therefore incapable of consistently and predictably generating power throughout the day. The utility needs to design compensation for the resulting voltage fluctuations in order to prevent the system parameters from exceeding the safe operating region. By measuring and recording information about distributed generation installations, the utility will be able to install appropriate compensation systems to protect the system as a whole. Over the next several decades, demand for electricity is projected to rise by at least 30% . It is becoming less and less practical to construct new large-scale generation plants, so in order to meet this demand, we must turn to renewable energy, making it is imperative that we ensure the system is capable of accepting a significant volume of energy from distributed generation. The solution of widespread renewable energy in homes will satisfy our increasing thirst for electricity while simultaneously offering a significant advancement in our goal to reduce our overall carbon footprint. In the next installment, we will discuss some real-world implementations of smart meters in distribution systems, exploring key issues that must be considered when deploying these technologies. D Y Raghavendra Nagesh, J V Vamshi Krishna, and S S Tulasiram, “A Real-Time Architecture for Smart Energy Management,” in Innovative Smart Grid Technologies, Washington, D.C., January 2010, pp. 1-4. Ali Vojdani, “Smart Integration,” Power and Energy Magazine, vol. 6, no. 6, pp. 71-79, November-December 2008. Real time system monitoring is a relatively new tool available to power system operators, allowing them to analyze all aspects of a large power system continuously. Phasor measurement units are the leading technology behind the newfound ability to provide instant analysis for problems in a geographically enormous power system. Using a synchronous clock based off GPS timing signals, phasor measurement units (PMU) can very accurately measure current and voltage phasors with almost no time difference between meters . This allows for real time information regarding power angles and power flow, system status, and possible problems. With phasor measurement refreshing frequencies as high as 60Hz, the synchronized clock time of all PMUs is an essential requirement for providing accurate information to data centers, where a delay of several microseconds could lead to corrupt results. Because of the timing constraints required by PMUs to perform properly, PMUs now abide by the IEEE standard C37.118, which defines standardized measurement methods, timing tolerances and communication channels. The widespread implementation of PMUs has led to wide area monitoring systems (WAMS) allowing for situation reports for large parts of the transmission system. PMUs transmit this system information continuously to data centers where computers can record and monitor the state of the entire power system, performing actions to maximize power flow while maintaining system stability . Fault detection and proper relay functioning is one of the most important tasks in transmission systems, accounting for approximately 70% of all major disturbances . By using PMUs and having snapshots of the entire system updated up to 60 times per second, the detection of faults is very quick. By having all of this data available at a centralized location, coordination of relays during faults can be optimized for the situation, resulting in the best fault clearing schemes. Wide area monitoring systems have been integrated into many transmission systems globally, allowing transmission operators to have continuous real time information about the state of the transmission system. WAMS technology plays an important role in generation and protection, allowing generating facilities to observe system conditions continuously and maximize their output for different loading scenarios. 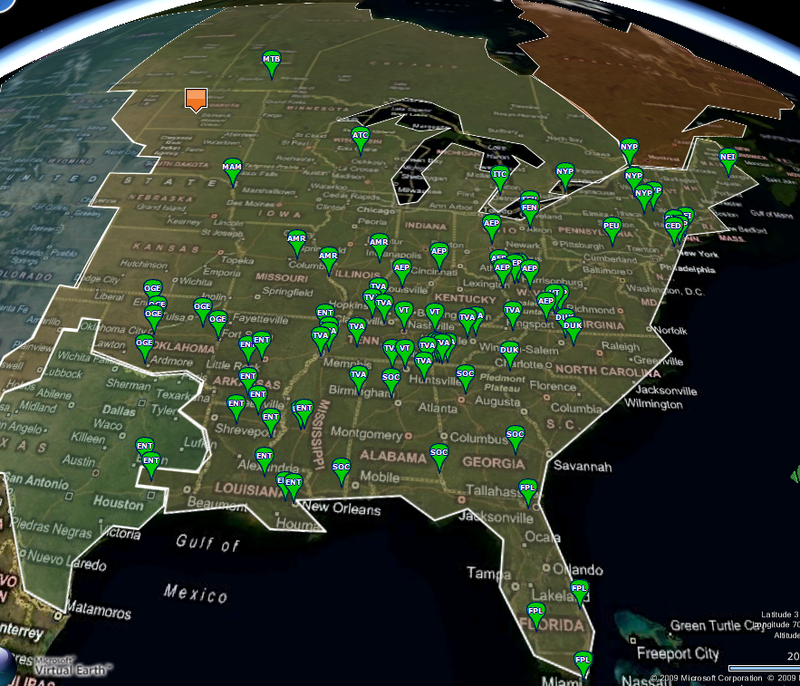 The eastern North American WAMS recorded all major transmission system information during the 2003 blackout, and provided critical data for the reconstruction of the sequence of events leading up to the blackout . However, the lack of intelligent control schemes left the system incapable to react quickly enough to maintain stability, resulting in the loss of power to millions of people. The 2003 North American blackout showed the world and the grid operators that the conventional power system ideas put in place over 100 years ago are not sufficient for the complex and continually growing power system of modern times. The blackout left over 50 million people without power, and was caused by the incorrect tripping of transmission lines and generation facilities . Investigations conducted revealed that the cause of the cascading blackout was due to distance relays operating within Zone 2 and Zone 3, with preset calculations. The problem originated when the Midwest Independent System Operator (MISO) had a problem with its state estimator , and the information gathered from the eastern WAMS due to offset in PMU sampling times . The state estimator is responsible for indicating potential problems with system parameters and operations, without this tool operators were unaware of the initial problems leading up to the blackout. After initial transmission trips to which operators were not aware, overloading of remaining lines caused them to reach thermal limits, ground faulting through trees. After losing several large transmission lines, distance relays started operating incorrectly in zone 3, seeing low impedance due to high load current and low voltage from tripped generation capacity. Had the WAMS been operating correctly, the initial problematic events that lead to the eventual blackout would have been identified, and problems could have been corrected before the situation elevated to such severe levels. Phasor Data Concentrators (PDC) are devices distributed throughout the transmission system designed to collect data from the many phasor measurement units. Due to the high volume of data collected, each node typically collects data from only five or six individual PMUs and forwards the data to concentrator devices. 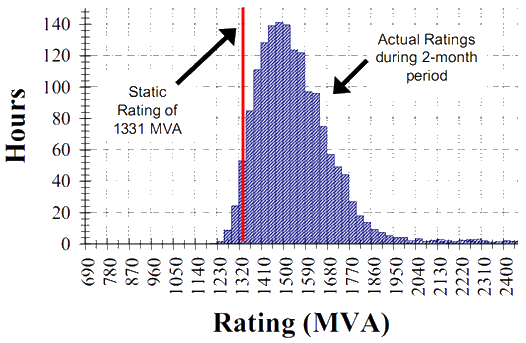 In October 2009, the Tennessee Valley Authority (TVA) released data collection software for industry use called SuperPDC (Super Phasor Data Concentrator) , which is responsible for aggregating measurements from multiple PDCs and archiving measurements for subsequent event analysis. It is now available under an open source license under the name openPDC. This software allows the TVA to collect data from its 120 online PMUs (see Phasor Measurement Unit Map) that together measure almost two thousand parameters several times per second. In all, the TVA archives 150 million measurements per hour (requiring 36 GB of storage space per day) . In conjunction with graduate students from Washington State University (WSU), the Tennessee Valley Authority collected data from its PMUs to observe local area oscillations within the system during a major switching event. During a planned switching of 500kV transmission lines at the Cumberland Fossil Plant (CUF), the system experienced a dangerous undamped local-mode power oscillation at 1.2Hz, which continued until operators detected the problem and reversed the switching three minutes later. 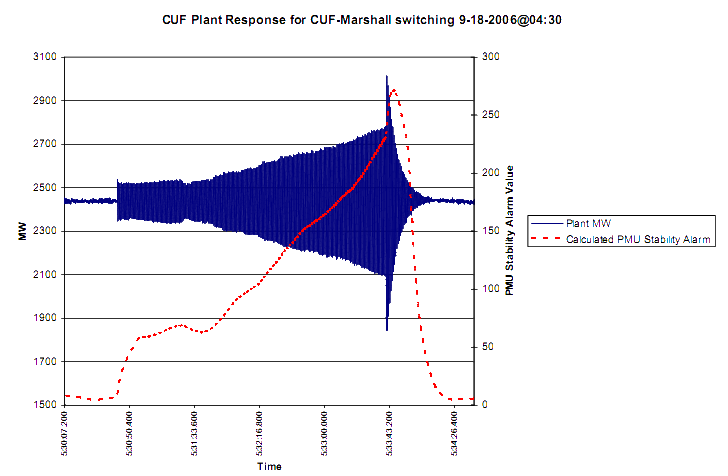 At its peak, the oscillations escalated up to a 700MW variation in transmitted power (see Cumberland Fossil Plant Oscillation Event). Without the phasor measurement units in place, detection of this nearly catastrophic event would not have been possible and the system could have suffered a total collapse. It remains unknown whether the power system stabilization (PSS) equipment was not yet installed or otherwise out of service during the fault . Fortunately, but both local- and inter-area oscillations can be detected using this method and the software is available for immediate use by any utility . The amount of power transfer over transmission lines is limited by the thermal limit of the line, putting constraints on profits and maximum generation capacity. Lines ratings are typically set to conservative constant values for the sake of safety and reliability, but newer technologies are enabling utilities to vary equipment ratings based on environmental factors including humidity and ambient temperature. When the Electric Reliability Council of Texas (ERCOT) implemented dynamic rating of their transmission lines, they were able to maximize utilization of existing infrastructure, which had direct financial benefit for bulk generation facilities exporting power. A control system used data including current atmospheric conditions, forecasted temperatures and system loading to determine the maximum power transfer limits, which usually exceeds the constant ratings given by the manufacturer . Yilu Liu, Lamine Mili, Jaime De La Ree, and Reynaldo Francisco Nuqui, “State Estimation and Voltage Security Monitoring Using Synchronized Phasor Measurement,” Virginia Polytechnic Institute and State University, Blacksburg, VA, PhD Dissertation 2001. Charles Proteus Steinmetz, “Complex Quantities and Their Use in Electrical Engineering,” in Proceedings of the International Electrical Congress, Chicago, Illinois, 1893, pp. 33-74. Yi Zhang, M. Prica, M.D. Ilic, and O.K. Tonguz, “Toward Smarter Current Relays for Power Grids,” in IEEE Power Engineering Society General Meeting, Montreal, QC, 2006, p. 8. J.F. Hauer, N.B. Bhatt, K. Shah, and S. Kolluri, “Performance of “WAMS East1″ in Providing Dynamic Information for the North East Blackout of August 14, 2003,” in IEEE Power Engineering Society General Meeting, Denver, CO, 2004, pp. 1685-1690. A.P. Apostolov, “Distance Relays Operation During the August 2003 North American Blackout and Methods for Improvement,” in IEEE Russia Power Technology, St. Petersburg, Russia, 2005, pp. 1-6. Kyeon Hur et al., “High Wire Act: ERCOT Balances Transmission Flows for Texas-Size Savings Using Its Dynamic Thermal Ratings Application,” IEEE Power and Energy Magazine, vol. 8, no. 1, pp. 37-45, January-February 2010. One of my partners wrote the majority of this article for a report submitted to ECE4439: Conventional, Renewable and Nuclear Energy, taught by Professor Amirnaser Yazdani at the University of Western Ontario. It is included here for completeness with the rest of the articles. I edited the article and wrote the sections entitled: Open Phasor Data Concentrator (OpenPDC) and Tennessee Valley Authority. The ZigBee protocol enables communication using multiple network topologies, including star, tree and mesh . It is particularly challenging to ensure reliability of the communication channel for smart meter designs, especially with the use of wireless-based backhaul channels and ZigBee is particularly suited to this application with its mesh network topology. In case a meter is out of range of a central tower or otherwise obstructed by buildings or other objects, ZigBee-based meters enable communication between meters and relaying of information back to the data collection point . Furthermore, since ZigBee devices utilize the unlicensed 2.4GHz spectrum, they have a very low cost of deployment and allow seamless integration and networking of many ZigBee devices. Although they have many benefits, ZigBee devices are designed primarily for short-range communication and low device power requirements , requiring a separate wireless protocol for long-range transmission. ZigBee is a key technology enabling the OpenHAN networking standard discussed later in this paper. Because electricity is charged at a constant price in the current power system, regardless of time of use, consumers therefore have little incentive to put forth effort to change their usage patterns. Introducing smart grids will allow for dynamic billing based on market pricing at the time, and thus give more incentive to customers to plan their energy usage . With the proposed automated demand response, individual smart meters will have the capability of monitoring system wide conditions, determining when the system is stressed and appropriately allocate power to different appliances. Automated demand response will aim for reducing high loading during peak times, in an attempt to remove excess stress from the power system . Open Automated Demand Response is a standard currently under development , which aims to ensure interoperability between various smart meter infrastructure devices. It will provide a way for users program appliances to operate according to current electricity prices, for example to do laundry when power is cheapest. Open Home Area Network is a proposed standard to interface with the smart meter in residences with appliances in the home. OpenHAN can allow for utility control of the appliance, customer coordination and timing of appliance activation, and operational states of appliances based on set-points such as price. Upon completion and implementation of this standard, residents will be capable of having appliances automatically run during times when electricity is cheapest, and utilities will be able to cease operation of appliances during peak loading times. OpenHAN is the fundamental idea behind automated demand response, where there exists a link between the smart meter of the customer and the customer’s appliance . WiMAX is an industrial wireless interoperability standard related to the existing technology known as the Global System for Mobile Communications (GSM) . It is typically used for land-based wireless Internet service providers, particularly those serving rural communities; however, it is finding applications within power systems as a backhaul for smart meter telemetry data . Several different startup companies have explored the use of Broadband over Power Lines (BPL) as an Internet service delivery or as a backhaul for telemetry from smart meters . While it is no longer a serious contender for delivering Internet access to remote communities, the technology still has its niche applications, particularly within the realm of power systems. Some smart meter vendors continue to sell smart metering equipment that transmits telemetry over power lines  rather than using its own radio frequency, which requires the purchase of costly spectrum. Furthermore, using BPL couplers traditionally used for sending and receiving data across power lines can be used to listen for types of noise characteristic of certain types of equipment failures; for example, a cracked insulator beginning to fail will induce a specific signature pattern that can be detected using BPL couplers . Peng Ran, Mao-heng Sun, and You-min Zou, “ZigBee ROuting Selection Strategy Based on Data Services and Energy-Balanced ZigBee Routing,” in IEEE Asia-Pacific Conference on Services Computing, Xi’an, China, 2006, pp. 400-404. Hoi Yan Tung, Kim Fung Tsang, and Ka Lun Lam, “ZigBee Sensor Network for Advanced Metering Infrastructure,” in Power Electronics and Drive Systems, Taipei, Taiwan, 2009, pp. 95-96. David Andrew, “National Grid’s use of Emergency Diesel Standby Generator’s in Dealing with Grid Intermittency and Variability,” in Open University Conference on Intermittency, Milton Keynes, UK, 2006. Dan Yang and Yanni Chen, “Demand Response and Market Performance in Power Economics,” in Power and Energy Society General Meeting, Calgary, AB, 2009, pp. 1-6. Ivin Rhyne et al., “Open Automated Demand Response Communications Specification,” Public Interest Energy Research Program (PIER), California Energy Commission, Berkeley, CA, PIER Final Project Report 2009. Zheng Ruiming, Zhang Xin, Pan Qun, Yang Dacheng, and Li Xi, “Research on coexistence of WiMAX and WCDMA systems,” in IEEE 19th Internetional Symposium on Personal, Indoor and Mobile Radio Communications, Cannes, France, 2008, pp. 1-6. G.N. Srinivasa Prasanna et al., “Data communication over the smart grid,” in IEEE International Symposium on Power Line Communications and Its Applications, Dresden, Germany, 2009, pp. 273-279. X. Qiu, “Powerful talk,” IET Power Engineer, vol. 21, no. 1, pp. 38-43, February-March 2007. Larry Silverman, “BPL shouldn’t mimic DSL/cable models,” BPL Today, pp. 1-7, July 2005. One of my partners wrote the majority of this article for a report submitted to ECE4439: Conventional, Renewable and Nuclear Energy, taught by Professor Amirnaser Yazdani at the University of Western Ontario. It is included here for completeness with the rest of the articles. I edited the article and wrote the sections entitled: Worldwide Interoperability for Microwave Access (WiMAX) and Broadband over Power Lines. Over a century ago, power engineers designed the majority of what we see in the today’s power system infrastructure, based upon significant research during the infancy of wide-scale electric power generation, transmission and distribution. At the time, utilities built centralized electrical generation under the assumption of unidirectional power flow from the plant to the customer. These concepts were appropriate for the demand and complexity of the power system during that time; however, with growing electrical demand of modern society, we must take a closer look at these assumptions. Increasing fuel costs for centralized generation as well as changing social attitudes is leading to increased distributed generation from renewable resources including solar and wind. Distributed generation has changed the way that the power system operates, allowing many small generation facilities to contribute power in order to meet current electricity demand collectively. Consequently, utilities anticipate that distributed generation systems will introduce new problems since it violates the previous assumption of unidirectional power flow. Distributed generation introduces the phenomenon of bidirectional power flow, resulting in adverse effects on conventional protection and voltage regulation equipment in the existing power system. Indeed, many American states have adopted renewable portfolio standards, which require a pre-determined amount of electricity to come from renewable sources by as early as 2013 (for details, see Appendix A: Renewable Portfolio Standards). With dwindling supplies of fossil fuels and increasing prices for crude oil and petroleum products, electric vehicles are steadily gaining momentum. Although electric vehicles are not yet mainstream, they are expected to have a significant impact on the method and amount of power distribution in the near future as drivers begin switching from gasoline-fuelled vehicles to their electric equivalents en masse. The increasing popularity of plug-in electric and hybrid-vehicles introduces issues to the power system since it effectively doubles or triples power consumption in already strained residential areas. There are several problems faced due to the way in which the current power system is configured. The problem lies not with the method by which the electric car is charged, but rather the number of electric cars being charged, as well as the total amount of energy required to charge each car on a daily basis (see Appendix B: PHEV Demand Increase Example). This large increase in electrical demand will require additional generation facilities to meet the demand, and require new equipment to deal with the increased demand of consumers. This paradigm shift will severely affect distribution utilities since the current generation of residential transformers is not rated for such high peak demands. By implementing smart grids, local distribution utilities will be able to mitigate the problem by staggering the charging sequence of each electric vehicle. Furthermore, utilities can explore the use of hybrid vehicles as a distributed storage technology or as a power factor controller. Indeed, the smart grid has the potential to reduce loading on residential substations and small distribution transformers, which eliminate the necessity for expensive high-capacity equipment. Not only is the total electrical energy usage of the family almost tripled for every month, but charging peaks at night-time would exceed the peaks during the daytime and also prevent transformers from cooling down at night (in case they are being run above rated conditions during the daytime). A partner and I originally wrote this article for a report submitted to ECE4439: Conventional, Renewable and Nuclear Energy, taught by Professor Amirnaser Yazdani at the University of Western Ontario.